Red Country is set in the fantasy world of Joe Abercrombie's First Law Trilogy, The Heroes and Best Served Cold, which typically puts fantasy tropes into a modern perspective. In the dedication to Red Country, Abercrombie writes "For Teddy And Clint Eastwood. But since Clint probably ain't that bothered. Mostly Teddy. ", although I can't say precisely what the authors intention was, one of the merits of this series of books is the character development of the protagonists and antagonists. The feel of the characters tends to be analogous to the feeling one gets watching the character development in some classical and more recent movies set as "Westerns", such as the modern classic "Unforgiven" (Director Eastwood 1992). Abercrombie's main characters tend to be antiheroes and in the fantasy setting the author uses, he explores ethical and sociological issues, which tends to be a feature of the movies that Clint Eastwood has directed. In the First Law Trilogy the traditional "good guys" are the Union, a medieval kingdom organized with a king and chancellors, that has as part of its internal security an "Inquisition" and a creation myth a featuring a Merlin type wizard called "Bayaz". The main characters of the First Law Trilogy would, in the traditional fantasy trope, be the just, brave and noble defenders of a shining Camelot, in the First Law trilogy the "heroic" characters are vicious, cowardly survivors of a corrupt and incompetent government with the Merlin wizard character appearing more a fraud than a powerful wizard of legend. There is an undercurrent of humor, in the contrast between what is with what should be. In "The Heroes" the Union finds itself fighting rebels in the Northern countries, the Union forces tend to be newly conscripted farm boys with crossbows and pikes against tough clansmen with bows and claymores fighting in their home forests. In Red Country the Union has been fighting the rebels in the cold periphery of its northern states and as part of its mop up operations it employs a mercenary company to operate in territories along and over its border. These territories are a hard scrabble to many but echo an incipient industrial revolution occurring in the Union and allow some to create communities away from the social structures of the Union. Tolkien wrote with the spectre of the First and Second World Wars and the influence of the Norse, Volsunga and Beowulf sagas. In the Red Country, the fantasy setting is descriptively violent but this tends to convey a sense of loss, perhaps echoing the quote from Unforgiven (1992) said by the character William Munny " It's a hell of a thing, killing a man. Take away all he's got and all he's ever gonna have". The antagonists tend to have understandable, sometimes even noble motivations and the protagonists are flawed, which I find more psychologically interesting. The fantasy world setting of the books The Heroes and Red Country are sequential, leading from the First Law Trilogy, and thus can be seen as part of a related chain of books/ novels. Red Country can be described as developing the themes of technological and social change, previously in the First Law Trilogy magic served as a metaphor for the dangers of technology . These themes challenge the trope of a medieval setting in the traditional fantasy genre and has a stronger convergence with our world view. It also fits in with themes contained in a Western/ Wild West genre and it can be argued Red Country merges the fantasy and western genres. When I bought the book I was told by the salesman that it wasn't as good as the previous First Law Trilogy. I didn't really have any expectations, The Heroes is about describing the sides of a battle and can be argued to be an experiment by the author. 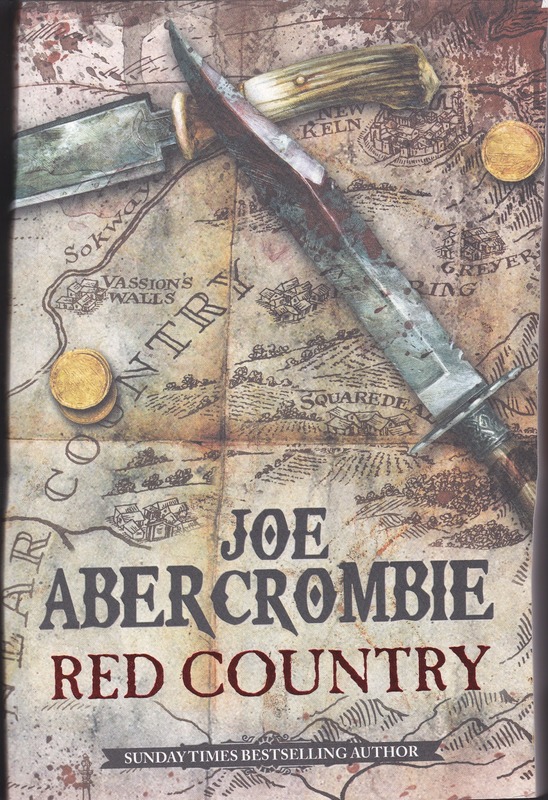 Red Country can be described as a quest novel but thankfully instead of a quest focusing on a magic item be it magic sword or ring, is about something more psychologically relatable. Abercrombie, Joe. (2012). Red Country. Published by Gollancz, London. Printed by Griffin Press, Australia. 451 Pages.